Once you've established a successful marine tropical fish aquarium you may well get to thinking about buying anemones. Lively and beautiful, a healthy anemone will add colour and character to your tropical fish tank and help to provide an interesting environment for your fish. However, anemones can be extraordinarily difficult to keep. The first thing you need to know about anemones is how to choose a healthy one. Anemones have a slow metabolism, so they don't show changes dramatically, but an unhealthy one may die with little apparent warning. Don't buy one which looks damaged, which doesn't move about much or which has short tentacles when it is supposed to have long ones. Check that it is firmly attached in the tropical fish tank you take it from - this should mean it can attach successfully in your tank, especially if you provide it with a good live rock base. A healthy anemone should not look pale and transparent - it needs to contain algae in order to feed. Many people buy anemones as companions for their clownfish, so that they can enjoy observing the symbiotic relationship between the two. However, it's important to realise that not all anemones are compatible with clownfish. Others may represent a hazard to your other fish or to coral in your aquarium. Listed below are some of the most popular choices for beginners. Maroon Anemone - Sometimes known as the rose anemone, this is relatively easy to keep and may even reproduce within your aquarium. It is quite active, moving around the aquarium a lot, and is popular with most species of clownfish. Long-tentacled Anemone -These tend to be sedentary but wave around a lot, providing a good environment for clownfish. They need sand in the tropical fish tank in which to anchor themselves. Beaded Sea Anemone -Green or brown in colour, these prefer a sandy substrate and can expand impressively if well cared for. They are sometimes accepted by clownfish. Purple Condylactis -Striking to look at and comparatively easy to care for, this unfortunately will not always get along with clownfish and may sting and damage coral in your aquarium. Saddleback anemone -Popular for its distinctive stripy pattern, this is fairly easy to keep and will grow fast in good conditions. However, it may eat small fish, though it is often compatible with clownfish. The precise needs of anemones vary by species, but one thing you can be sure of is that they will need strong light in order to survive. This enables the growth of the symbiotic algae upon which they are dependent. If you want your anemones to flourish you should seriously consider investing in metal halide lighting for your aquarium. Anemones prefer an environment which is free from organic wastes. This can create a problem if you are keeping them alongside coral, in which case timing your coral feeding and using a protein skimmer in the tropical fish tank is the best policy. Like corals, anemones can benefit from the addition of trace nutrients like iodine into the water - be sure to read up on the species you choose to determine its particular needs. It's best not to try and keep more than one species in an aquarium until you're sure you know what you are doing. Although there are some commercial liquid food products available for anemones, it is usually best to avoid these, as they can lead to water pollution which damages the anemones' health. Anemones need to be fed only once every two to three weeks. Food should be delivered directly to their mouths. Most forms of seafood (clams, oysters, mussels etc.) are suitable, though shrimp tend to be preferred. 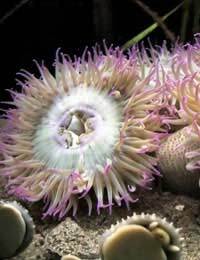 Cut the food into small pieces and make sure it is soft enough for the anemone to eat. If you have clownfish they will do the job of feeding the anemone for you, though you should be aware that they may try taking it fish flakes, which it will reject, so you must still make sure that suitable food enters the aquarium. A healthy anemone is a good sign of a healthy tropical fish tank. Take good care of water quality, lighting and food and there is no reason why your anemones shouldn't thrive, making a spectacular impression on everyone who sees them.